Soaring over the treetops, in undulating flight alternating briefly with strong intervals of flapping, wings tucked in close to their bodies, the birds in the Picidae family are spectacular to view. The Picidae family includes the impressive Woodpeckers as well as Piculets, Wrynecks, and Sapsuckers. There are eight extant families in the Order: Piciformes. There are over 180 species—some sources tout as many as 200—and about 30 genera in the Picidae family. Many species are threatened or endangered due to loss or fragmentation of habitat. The Ivory-billed and the Imperial Woodpecker have been considered extinct for about 30 years, although recent claims of sightings have created some controversy over the veracity of this assumption. There has been no solid proof that either of these species still exists. They primarily inhabit wooded areas and forests, although they are often found in neighborhoods filled with high numbers of old-growth trees. They prefer dead or dying tree trunks in which to hollow out their nesting/roosting cavities. 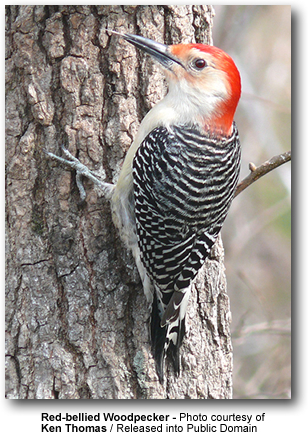 Some species require very specific conditions for their homes; for example, the Red-cockaded Woodpecker can only live in mature pine forests in the southeastern United States. Most dwell in their homes year-round; in the breeding season, it becomes a nest, and between breeding seasons it serves as a nightly roosting spot. The different species vary in social strata from the highly antisocial, aggressive, solitary species to those that favor communal living. The communal dwellers are also likely to breed in communal settings. These birds reside all over the world, except for Australia, New Zealand, Madagascar, the oceanic islands, and the extreme Polar Regions; however, they have been spotted on some of the continental islands. This widespread habitation makes it impossible to come up with a population count. The Ivory-billed, still considered extinct by most authorities, was thought to be sighted in 2006 in Arkansas, but no definitive proof exits. Some scientists believe there might be a second population in the cypress forests of Florida’s panhandle. The Red-cockaded Woodpecker populations are estimated at 5,000 to 10,000 within their territories. It can be found through the southeast of the United States from Texas to the Atlantic Coast and north to Virginia. According to the monitoring programs initiated by the Swiss Ornithological Institute, the breeding populations of quite a few arboreal species have increased between 1990 and 2008. They attribute this to an increase in the amount of deadwood in forests during this time period. Among those species which have benefited from the increase in this important habitat element are the Black, Great-spotted, Middle-spotted, Lesser-spotted, European Green, and the Eurasian Three-toed Woodpecker. Some birds, including the White-backed Woodpecker, have benefited from the upsurge in deadwood in the Swiss forests by expanding their ranges during that same period. The growing availability of deadwood is likely to be the most important factor explaining this population increase. Most species dwell in forests or woodland habitats, although a few species are known to live in less ideal areas such as rocky hillsides and deserts. These arboreal birds achieve their greatest diversity in tropical rainforests, but have colonized almost all sustainable habitats, including woodlands, savannahs, scrublands, bamboo forests, grasslands, and deserts. Even those birds inhabiting less favorable locations, such as deserts, do best in areas where at least a minimum number of trees exists. 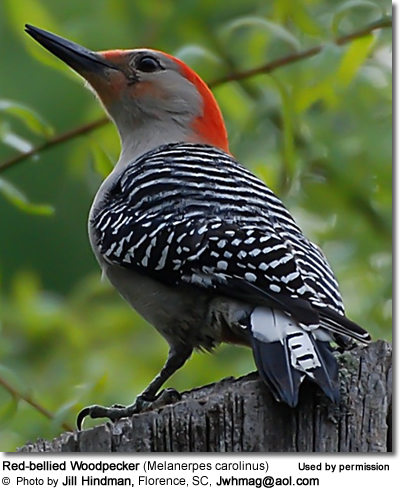 Still, the Gila Woodpecker, a desert species, has adapted by nesting in tall cacti. Some species have adapted their foraging methods by hunting on the ground part of the time, and a few species have abandoned trees altogether; they feed and build their nests in holes in the ground, The Ground Woodpecker is one such species, inhabiting the rocky, grassy hills of South Africa. Other species which prefer ground-dwelling are the Andean Flicker and the Campos Flicker of South America. Picidae species can either be sedentary or migratory. Many species are known to stay in the same area year-round while others travel great distances from their breeding grounds to their winter homes. The males and females of most species are easily distinguished from each other. They are sexually dichromatic—the markings on the plumage differ. Males have a malar stripe—a little “moustache” or a patch of red feathers on the crown or gular (throat) area. In many of the species, the colors in the plumage are contrasting in their brightness, and many have black and white markings in their plumage. Their lengths range from 6½ to 14 inches. 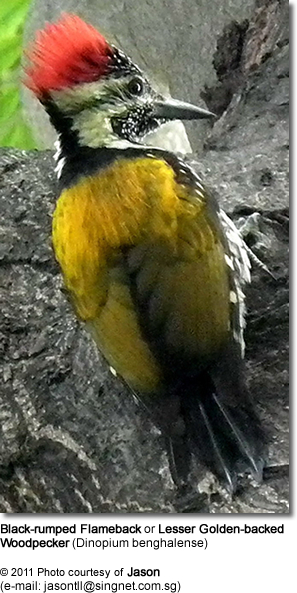 The smallest is the Bar-breasted Piculet, only 7 grams and 8 cm (3 ¼ in) long. The largest was the extinct Imperial Woodpecker, which averaged 58 cm (23 inches) in length and probably weighed over 600 g (1.3 lb). The Ivory-billed Woodpecker was (or is) slightly smaller, with a length of 50 cm (20 inches) and a weight of 500 g (1.1 lb). 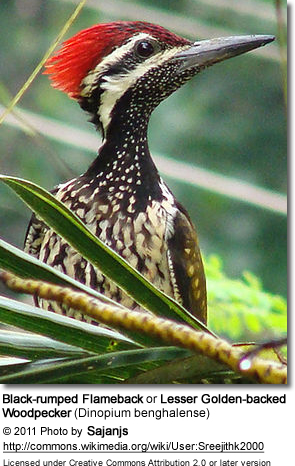 If both the Ivory-billed and Imperial Woodpeckers are indeed extinct, the largest living Woodpecker is the Great Slaty of Southeast Asia, at about 50 cm (20 inches) and 450 g (1 lb). A number of species exhibit sexual dimorphism (gender differences) in size, bill length and weight. 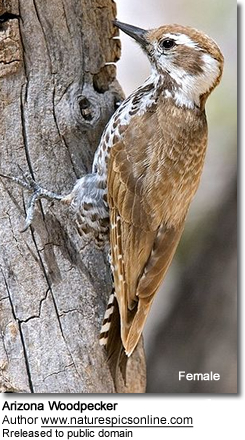 The female Piculets are often larger than the males, and in the sexually dimorphic species, it is usually the males that are larger. The bright plumage of most species includes the colors white, black, grey, brown, green and red. Many of them also sport patches of red and yellow on their heads, rumps or upper tail coverts which aid in their identification. In addition, some will exhibit spots or bars on their wings, and a few species will display yellow on the wings. Some species even possess diminutive crests. These varying patches play a significant role in the signaling among birds. The dark feathers are often iridescent. Although the sexes of Picidae species tend to look alike, the males of many species are known to have brighter red and yellow markings than the females.